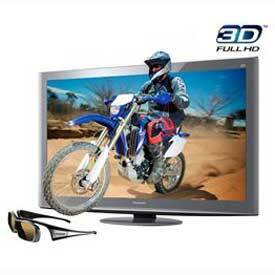 Wondering what you’ll watch in 3D on your new 3DTV? More than you may think. 3D video will come from a variety of sources—Blu-ray disc, cable, satellite, video game consoles, and in some cases content converted by your TV from 2D to 3D. Just as you see varying levels of video quality when it comes to regular HDTV programming, though, there are varying levels of video quality when it comes to 3DTV content. Some differences are based on the way a video is shot—native 3D versus converted 3d--others you can control by selecting the best source. The best picture you can get today—whether it’s 2D or 3D—is found on Blu-ray disc. It’s a 1080p Full HD picture, meaning all 1080 lines of resolution are painted progressively for each frame. (1080i signals send odd and then even lines and let your eyes fuse the two together.) For Full HD 3D, that’s two full 1080p pictures painted per frame—one for each eye. Next up are Sony PlayStation 3D and the pay-TV services: satellite, cable and FiOS. None of these set top boxes have the new high-bandwidth HDMI1.4a ports found on 3DTVs, so they can’t send a full HD 3D signal to your 3DTV. So either the horizontal or vertical resolution is cut in half, as the images are sent side-by-side (for interlaced signals) or top-bottom (for progressive signals). The resulting “half resolution” pictures are still impressive since your 3DTV is capable of filling out the missing pixels, usually through interpolation (educated guesswork). The quality of over-the-air or terrestrial signals, those broadcast from your local TV stations to your TV’s antenna, remains a question, since the standards haven’t been set yet. Since the amount of data that can be sent this way is limited, the highest resolution is likely 720p. If you’ve been to a few 3D movies, you’ll know that, aside from the story line, there’s good and bad 3D effects. Good 3D, like that found in the movie Avatar, provides a truly immersive effect. Done properly, the camera will change focus at the same speed your eyes do in real life. The director must plan for this during the shooting of the film. With movies like Clash of the Titans, which are shot in 2D and then converted to 3D, there’s human intervention to ensure there aren’t glaring 3D artifacts, such as limbs that belong to one character seeming to sprout from another. But the result still has a flat, pop-up book appearance. TVs with 2D to 3D converter chips, though, don’t have the human quality control, and results can be quite mixed.